A place to show-off my crochet projects — and my life! I made this fun penguin with the simple pattern from the Lionbrand website. I used Caron SS Quick yarn, which I bought just to try. 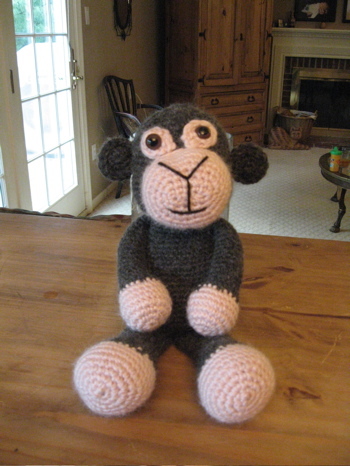 I love using chunky yarn to make animals. But I wasn’t really into the SS Quick. Unfortunately, when I ordered the blue yarn online, I accidentally put in the number 12 instead of the number 2 (please tell me I’m not the only one who does these things!). Then life got busy and I forgot to return the yarn (please, also tell me I’m not the only one who does these things!). So…today I’m hosting my first blog giveaway. Just leave a comment in the comments section (along with your email address), and let me know what you would make with 2 -4 skeins of blue mint Simply Soft Quick yarn. I will choose 2 – 3 winners and send the yarn to you. Giveaway ends Tuesday, July 22nd at midnight. Oh, and if you decide you want to make a blue penguin, you can find the pattern here. When I’m not working on birthday presents, I’ve been making these small bears lately. I love the pattern because I can make a bear in one night. It’s quick and really cute. I hope to make many of these and just keep them on hand to give as gifts as needed. 3. Made with some soft, fuzzy yarn I bought at JoAnn (forget the name). I love the look and feel of the yarn, but haven’t liked anything I’ve made with it! I’m naming this the Abominable Snow Bear! I also made one in dark brown, which I gave to my dad for his birthday. I’ll be making more of these this week. I want to try using some other yarn, and make a few new rainbow bears as well. We took a fairly long road trip, and I had jury duty when I came back! I made my son his 7th birthday present (which I’ll post later in the week), a hat, a purse, and a dog. Busy crochet week. The purse is a present for my mother-in-law. I made the same purse for Caroline for my first Swap Swap Gals swap. I used double strands of lion brand cotton and a J hook. It’s my own pattern, which I made after looking at lots of purse patterns. Then I made this stuffed dog for my nephew’s third birthday. I also made up the pattern for this one, using Lion Brand Homespun and a J hook. Both are going in the mail tomorrow, so I wanted to get their pics posted tonight. One of the reasons I started this blog is so I can remember what yarn and hooks I use for various projects. Of course, I haven’t been mentioning any of this. So now I’m going to put up some of my recent projects and remind myself how I made them. Believe it or not, I made these as a baby shower gift for my friend who is having her first girl (after having three boys)! I wanted her to have something fun and pink in her nursery. I used KristieMN’s pattern and double strands of some baby pink yarn (I don’t remember what). I made the body somewhat bigger than in the pattern. I also made a small bear from a pattern I bought from Etsy. I love this pattern as it’s small and versatile and is a great use of scrap yarn. The one on the left is the one I made. I used Bernat Softee Chunky and an I hook. I used this for the colorful flower, but only made three rows. The daffodil is from the LionBrand website. These were so much fun! I used Roman Sock’s pattern, and really used these as a way to experiment with the yarn. On one, I crocheted only in the front loops. 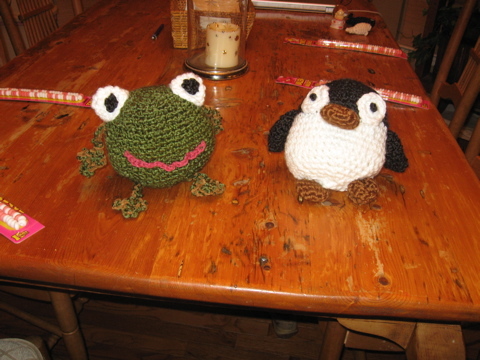 Then I made one crocheting in both loops…I wanted to compare and see if they came out the same size (they did). I used Lion Brand Homespun for those, with an I hook. Then I used some super fuzzy white yarn that I bought at JoAnn, and some blue yarn (also bought at JoAnn). I used fun fur on the blue one, just to see what that would look like. This bear was also a great project for me to learn on. I used Lion Brand Jiffy yarn. I had made the bear once before, and I thought that the head came out way too small for the body. So this time, I made the head using a K hook. Then I switched to an I hook for the body and arms. I don’t remember what size hook I used for the feet; The bear came out much smaller than the first one I made. I think if I make him again, I might go up to a J hook for the body. It probably could have been slightly larger. Here’s my snake again. I actually made up the pattern, and used Homespun yarn with an I hook. I made another one for a friend using double strands of Red Heart SS camo yarn. I think I used the J hook on that one. I liked how he came out, but gave him away before I could take pics. That’s it. This is a long post, but it’s a helpful reference for me. My nephew turns two this week. He’s my only nephew (on my siblings side; my husband’s sister has a son), and he lives all the way across the country in California. I wanted to make him something special. 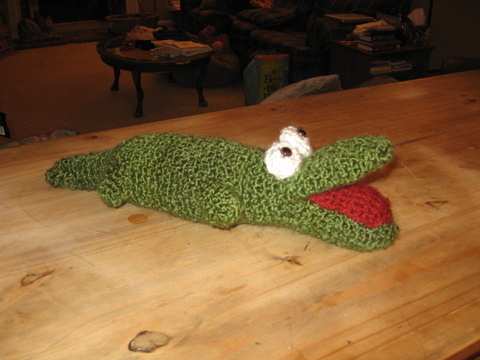 I had a lot of fun learning how to do the stitches so he bent each way to look like he is slithering! Then I got an email from my brother saying he was having an Elmo birthday party. So I decided to make him another gift, a big pillow shaped like Elmo’s face. I ran out of yarn right as I started on the decrease rows. And while I loved the size and fuzzyness of the yarn, I thought the color was too dark and dull. So I made him a giant red head using some Homespun yarn that I had. The color is much brighter and truer to Elmo than the Homespun version. But I thought it was too small. And I really love how soft and huggable the Homespun yarn is. So I went back to the Homespun version and decided to add a body. 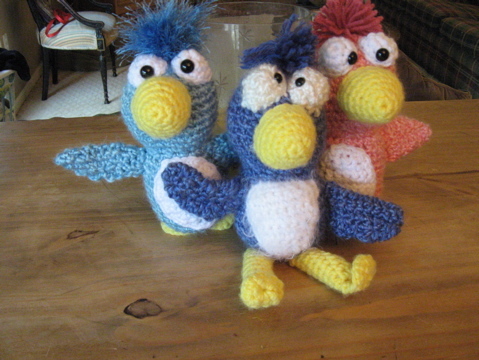 Here’s a picture of the three Elmos that I started in different yarns. It’s hard to see the difference in the pictures, but I think I made the right choice. I really don’t like crocheting without a pattern. I kept wanting him to look better, and I made his nose and eyes (and sewed them on) several times. I know he could still be better. But he’s going in the mail tomorrow! Happy Birthday, Teddy. p.s. I sent the snake to my other nephew. He’s almost three, and I know he’ll be loved. But now my kids all want a snake in their favorite colors! So I’ll be working on those after I finish a few other WIPs. I am working on my purse for the April Swap with Swap Swap Gals. What fun! It’s fun on two levels…I’ve never made a purse before, and I’m making one for someone I don’t know. I’m enjoying this project far more than I expected to! This was supposed to be for my sister-in-law’s birthday. But I wasn’t really pleased with him, so I made her a huge smiley-face pillow instead! Hopefully I’ll have some pictures to post soon of the pillow. And here is a fish I made for my daughter, because I wanted to see what would happen if I crocheted with double strands of chunky yarn! I love the fish, and it only took me 30 minutes to make. But it’s definitely harder to crochet with double strands. Things have been really challenging here lately, but I’m finding that crocheting (and prayer) is the most wonderful therapy. It’s really nice to sit down with some yarn, clear my mind, and let my hands make some fun little animal…or hat…or purse. Animals, hats, and purses…three of my favorite things! and I kept thinking that I would modify some of it. But in the end, I really liked the pattern and whenever I would deviate from it, I ended up ripping it out and going back to what was written. I’m not sure if I love his face. I wanted him to look sweeter. Happier, maybe. I may play around with his face and see if I can give him more personality. I can’t wait to make an animal from this pattern using Homespun yarn. I think it will be really cuddly and soft. These are my first amigurumi. I made them for my kids for Valentine’s day this year, using the free patterns I found on the Lion Brand website. I used Lion Brand Homespun, and LOVED the big soft way that they look. Does anyone else ever use Homespun yarn (or other chunky, bulky yarn) to make animals? 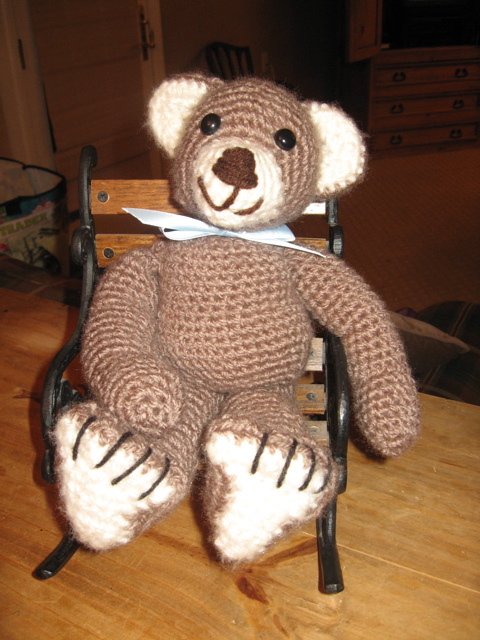 This bear is from a free pattern I found online called Boo Bear. 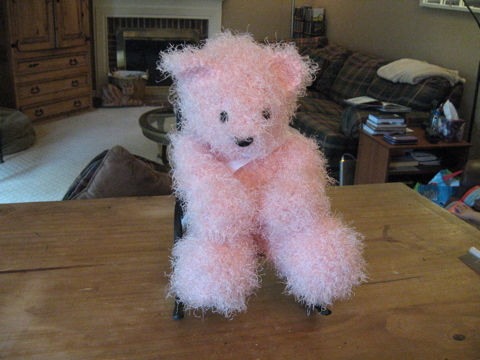 It’s actually for a thread bear, but I used Lion Brand Jiffy yarn and he came out much, much larger (and cuter). He was a baby gift for a friend’s nursery. I call him Avery Bear. I made him as a present for a 6-year old boy. My husband added felt teeth, but we gave him away before I could get a picture of him with the teeth! He’s from a pattern I found here: http://bittersweetblog.wordpress.com/2007/04/16/later-alligator/. 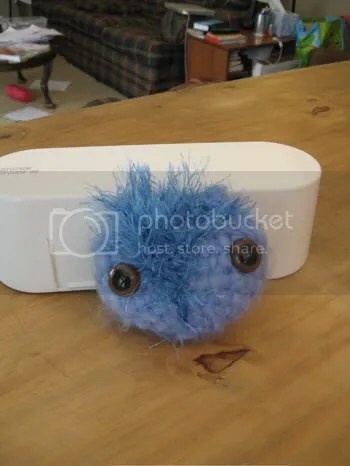 I used Lion Brand Homespun yarn, which made him big and really soft! 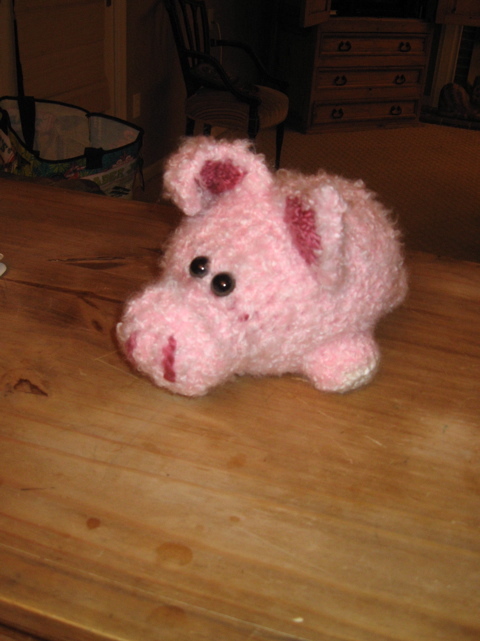 Pink fuzzy pig: I used baby yarn for him, and adapted the pattern from several pig patterns that I found online. 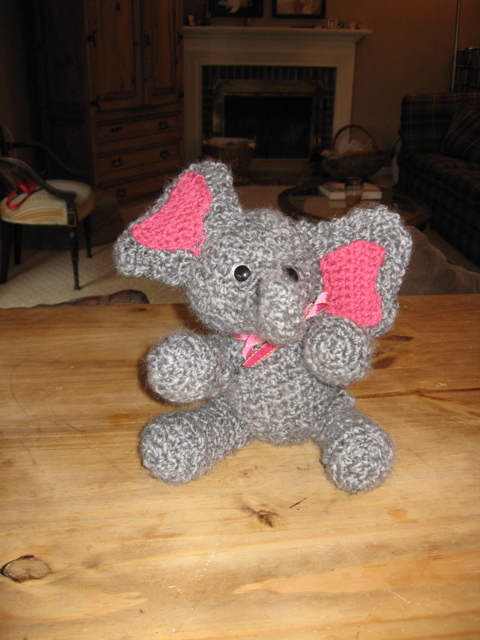 The Elephant is from KristieMN’s floppy friends pattern. Again, I used Lion Brand Homespun yarn to make her larger. She has a pipecleaner in her trunk, which helps it to bend. These farm animals are made of double strands of Homespun yarn . 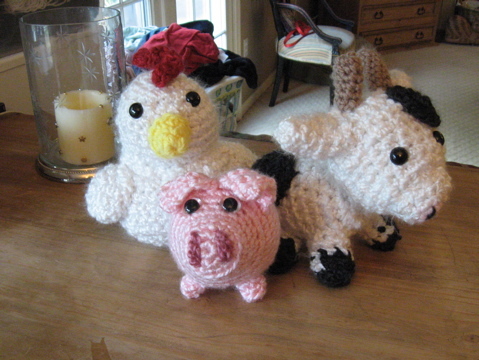 The cow and the chicken were made from KristieMN’s free patterns found on her website (http://kristieskids.weebly.com/patterns1.html). The animals are supposed to be tiny. But because I used double strands of bulky weight yarn, they came out nice and large. I used Caron Simply Soft Quick for the pig, which is also from Kristie’s website. These birds are my favorite. I bought the pattern on Etsy, and have had a lot of fun making them. I call them the Morning Birds of Happiness. Married for 16 years to a wonderful man who loves to laugh and keeps me laughing (and smiling). Mother to my 3 future best friends. Owner of the world’s funniest-looking dog. Trusting God with joy and humor as we live with amnesia and short-term memory loss.